***A hidden gem with plenty of room and options for indoor AND outdoor entertaining! This stylish 6 bedroom, 4 bath is located in the Granite Hills neighborhood of El Cajon. Inside of the home you will find luxurious crown molding, granite counter tops, stainless steel kitchen appliances, recessed lighting, upgraded bathrooms, and oak hardwood flooring throughout this spacious open floor plan! Stay green in this home with 10-panel solar paid-in- full! The large wooden deck and lower patio provide great sp***A hidden gem with plenty of room and options for indoor AND outdoor entertaining! This stylish 6 bedroom, 4 bath is located in the Granite Hills neighborhood of El Cajon. Inside of the home you will find luxurious crown molding, granite counter tops, stainless steel kitchen appliances, recessed lighting, upgraded bathrooms, and oak hardwood flooring throughout this spacious open floor plan! Stay green in this home with 10-panel solar paid-in- full! The large wooden deck and lower patio provide great space for enjoying the hillside view. Plenty of room for vehicles with a driveway that fits 4 vehicles and an additional driveway on the side of the home with a roundabout. Currently there is a bonus (7th) room built in the garage, however, it can be converted back, which would turn the garage back into a 4-car garage. Forty-foot storage container with shelving for storage next to horse corrals that simply need to be assembled. Outdoor shed. Back rooms are ADA approved. Tankless water heater. Central air and forced heating. ****Also includes city approved plans for a future granny flat! 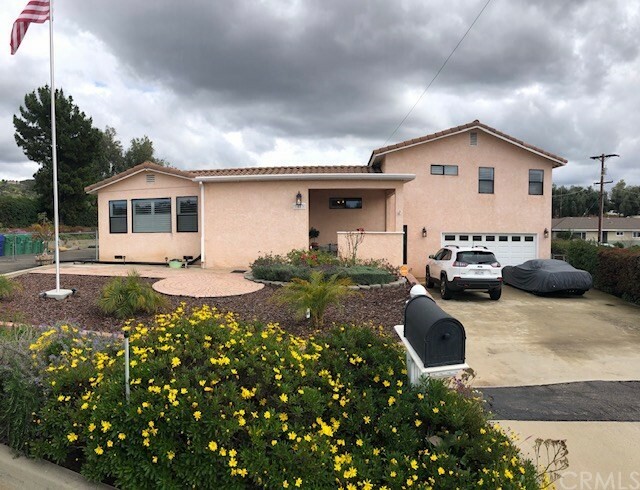 (value = $5k for already-issued plans and permits) This home can fit the needs of a big family with outdoor toys, equestrian, Air BnB investor, or construction company-owner! A must see!! Listing courtesy of M B-Real, Inc.